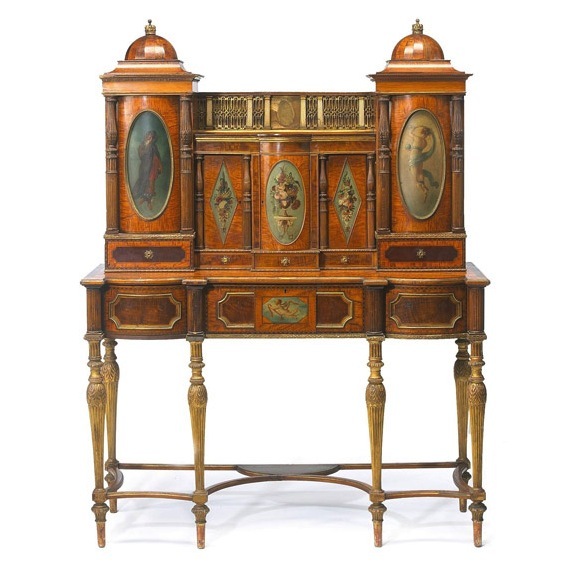 A satinwood, mahogany, sycamore and marquetry and parcel gilt secretaire cabinet, which was reconstructed from an important cabinet attributed to Seddon, Son and Shackleton reputedly for King Charles IV of Spain in 1793, is to be sold at Bonhams, New Bond Street as part of its Fine English Furniture and Works of Art sale on 7 March 2012. It has attracted a pre-sale estimate of £20,000 – 30,000. 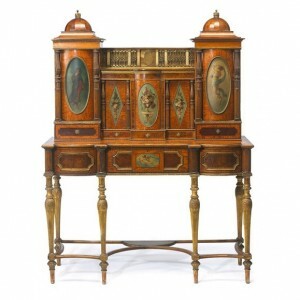 A remarkable survival, this cabinet is not only assembled from what was once described as one of the most spectacular late eighteenth century English cabinets ever produced (exhibited at the Franco British Exhibition in London, 1908 and the Plaza Hotel in New York, 1910), it was later acquired by MGM Studios in Hollywood for use on film sets. At some point in the twentieth century, the original `King Carlos IV’ cabinet was broken up and transformed into separate pieces of furniture. A commode incorporating elements of the centre of the cabinet has twice appeared at auction first in 1987 and latterly in 2006. However this secretaire which shares the same origins has remarkably remained unrecognised until it was recently identified by Bonhams in 2011. Another sale highlight is a Regency rosewood, ebonised and parcel-gilt library writing table attributed to the leading Lancaster and London cabinet-makers Gillows. The table was exhibited at the British Antique Dealers Association Art Treasures Exhibition in Bath in 1958, and has been in private hands since then. The pre-sale estimate is £30,000 – 50,000.